This gift tower, wrapped up with a beautiful bow, delivers a selection of classic bakery favorites for everyone to gather around and enjoy. 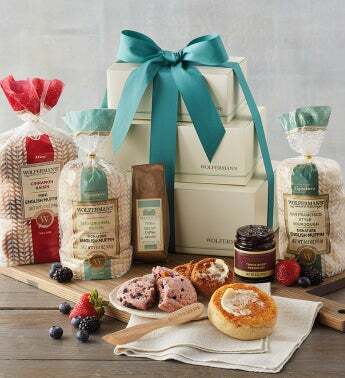 Includes our famous English muffins, fruit-filled scones, Tiffin Blend coffee, and much more. These irresistible bakery delights are a delicious way to start the morning or to snack on throughout the day.